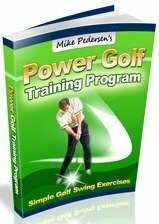 Here are some general arm strengthening exercises to consider for your golf strength training program. It is important to include both elbow and wrist strengthening not only to help improve club control, but also to help reduce the likelihood of an injury, such as tennis or golfer's elbow. The forearms are really the key area to strengthen in the arms (not counting the shoulders). The potential for injury is very high in the wrists and elbows due to the repetitive nature of the golf swing. The elbows are the anchor for the forearm muscles so they handle a lot of stress. In fact, elbow injuries are one of the most common golf-related injuries in amateurs! Making sure that this area is strong is extremely important. Also, if you are looking for more control with your chip or pitch shots, strengthening your forearms will help you reach that goal. In the upper arm, the two major groups are the biceps and triceps. A proper golf swing isn't very bicep intensive, but it is still good to strengthen this group to promote stability. You will use your triceps quite a bit not only for force generation during the downswing, but also to help slow the club down during the follow through. Many of the exercises below can be performed multiple ways. You can utilize free weights, resistance bands, barbells, and/or kettlebells to provide the resistance that you need. You also could challenge your self further by adding some instability either through a stability ball, or by simply balancing. For example, you could sit on a ball and perform any of the first four exercises to give yourself more of a core workout, or for the bicep curls specifically, you could balance on one leg to incorporate additional muscles. 1. Wrist Extension - With your hand in the palm down position and your forearm resting on your leg, grab a weight or band and extend your wrist in an upward direction. 2. Wrist Flexion - With your hand in the palm up position and your forearm resting on your thigh, grab a weight or band and flex wrist in an upward position. 3. Pronation/Supination - Hold a dumbbell by either base (a hammer works good, too). Start with your hand in the palm down position with forearm resting on your thigh. Turn you hand palm up and then back to palm down. 4. Bicep Curl - Bend elbow with palm facing forward. Pretty standard, huh? Try these variations for added forearm strengthening (primary movers in parentheses): Bend elbow with thumb facing forward (brachioradialis). Bend elbow with palm facing backward (brachialis). 5. Chair Dips - Stand in front of a chair (or exercise bench), with your back to the chair. Grab each armrest with your hands and slowly move feet away from the chair so that your knees are straight. Using your arms, lower your body and then push back up to the starting position by straightening your elbows. Other tricep variations: Cable column elbow extension, "skull crushers", overhead elbow extension with dumbbell. 6. Gripping - Use a stress ball, putty, or a rolled up towel and repetitively squeeze to help build up grip strength. Try some where you squeeze and hold for 5-10 seconds, and also perform some reps where you do rapid squeezes.